It is the most luminous gamma-ray pulsar ever observed that has been detected by two scientists from LPC2E (Laboratoire de physique et chimie de l'environnement et de l'espace, CNRS/Orleans University) and from IRAP (Institut de recherche en astrophysique et planétologie, CNRS/Université Toulouse III – Paul Sabatier), with their American colleagues from NASA in an international collaboration. Located at 163.000 light-years, in th Large Magellanic Cloud, it is the first gamma-ray pulsar detected in a galaxy outsite the Milky Way, which made it the farthest object known of this kind. This neutron star, that spins nearly 62 times a second, is the what is left after a massive star exploded one thousand years ago. The observation of a so young and powerful pulsar should enable to better understand the origine of their luminosity. This discovery, made thanks to NASA's Fermi satellite, was published in Science on November 13, 2015. PSR J0540-6919 is exceptional in more than one way: it is at the same time the first gamma-ray pulsar detected in another galaxy, and it is the pulsar that emits the most gamma-ray1. It also is noticably young: about 1000 years, while most of the known pulsars are at least 10 000 years old or even up to hundreds of million years old. NASA's Fermi Gamma-ray Space Telescope has detected the first extragalactic gamma-ray pulsar, PSR J0540-6919, near the Tarantula Nebula star-forming region in the Large Magellanic Cloud, a satellite galaxy that orbits our own Milky Way. Pulsars, neutrons stars that «blinks» as lighthouses, vestigial parts of some massive stars after their explosion as supernova. The fast spinning of these stars with a strong magnetic field induce the creation of radiations, by mechanisms still poorly understood. Radiowaves, visible light, X-rays or even Gamma-rays from the pulsars are located by telescopes periodically when they pass through the field of view of the instrument, when the star rotates. Over 2 500 pulsars are known, mainly detected in radiowaves by ground radiotelescopes. Some pulsars also emits Gamma-rays and the Large Area Telescope on board NASA's Fermi satellite discovered 160 of them, in our galaxy or in near clusters 2.To-day, for the first time, this instrument has discovered the first gamma-ray pulsar in a galaxy other than our own: the Large Magellanic Cloud,a small galaxy that orbits our Milky Way. It required to accumulate 75 months of data since the satellite became operational in 2008. Indeed, the signal coming from an area 163.000 light-years away is weak: it requires to collect enough photons to recreate it; then to class these photons in arrival order to determine if the luminosity vary. A Gamma-ray emission has thus been detected coming from PSR J0540-6919, a pulsar which had been already observed in radiowaves, visible light and X-rays. This signal presents pulsations every 50 millisecondes, exactly the same as the star rotation period! This is the indisputable proof that this object is the source. 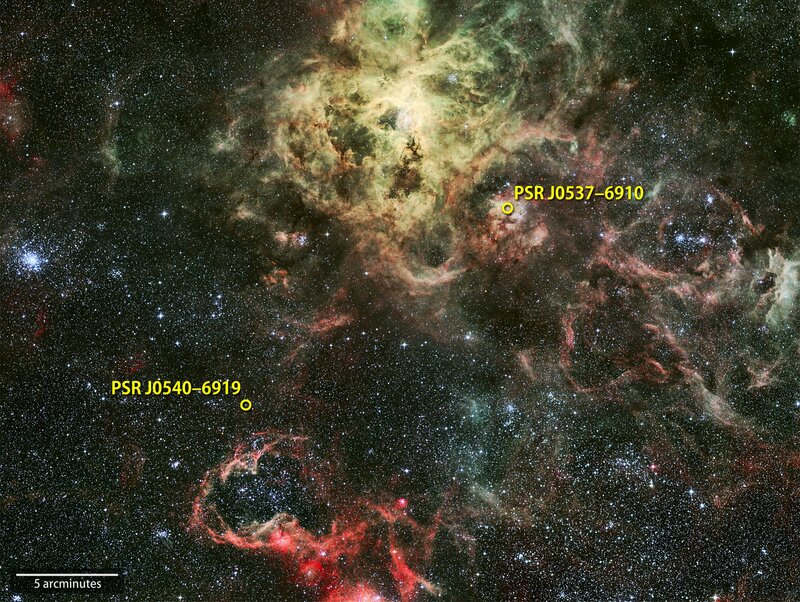 PSR J0540-6919 thus becomes the first known extragalactic Gamma-ray pulsar. The detection of a pulsar located at such a distance was also made possible by its extraordinary power: its fast spinning liberates a power over 1031 watt, nearly 100.000 time the luminosity of the Sun. In the Gamma-ray domain, PSR J0540-6919 is the most brilliant Gamma-ray pulsar known to this day, 20 times more luminous than the Crab pulsar, which was the more luminous pulsar in Gamma-ray known until now. Map of the Large Magellanic Cloud seen by Fermi LAT. comprising the Large Magellanic Cloud. The Gamma-rays are the main part of powerful young pulsar radiation, these new observations should enable to learn new things about the operating mechanisms in their magnetosphere, origin of the high energy radiations. Until then, these observations induce a new question… on cosmic rays. PSR J0540-6919 is located in the Tarantula Nebula, an area of the Large Magellanic Cloud very richin massive stars, And until now it was thought that most of its Gamma-ray radiation was coming from cosmic rays accelerated by the explosion of these massive stars, but not from the pulsars. A new enigma for the scientists which will have to understand why the cosmic rays contribution is much lower than foreseen. This work recieved the financial support from CNES and CNRS. the IRAP (Institut de recherche en astrophysique et planétologie, CNRS/Université Toulouse III – Paul Sabatier). 1. The Gamma-ray are the most energetic radiations. Typically, the gamma-ray radiation observed by Fermi's Large Area Telescope is a billion times more energetic than the visible light. 2. A cluster is a very dense concentration of stars. some of these clusters are in orbit around the Milky Way.